This study evaluates the feasibility of groundwater banking in the Central Basin. The Central Basin is located in Sacramento County in northern California, USA. The study basin is bounded by three rivers (the Sacramento, the American, the Consumes and Mokelumne rivers), and by the Sierra-Nevada mountain range. This study focuses on the potential for groundwater recharge in the Central Basin for three water years (critical, wet, above normal). For that purpose, a 3-D Groundwater Modeling System (GMS) with MODFLOW was created. Three recharge wells were added to the calibrated groundwater model to recharge the water table with 10,000 Acre-Feet (AF) of water to the Central Basin. The banking of 10,000 AF during the critical and wet years was effective in raising the water table elevation in the cone of depression area without causing any negative impact elsewhere in the basin. According to the findings of the Central Basin model, banking up to 10,000 AF of groundwater during any year type is feasible. More than 10,000 AF of groundwater banking might cause more negative impacts than positive benefits. This project investigates the feasibility of groundwater banking in the Central Sacramento County Basin (Central Basin). The area of the Central Basin overlies the California State Department of Water Resources’ (DWR) Groundwater Basin Number 5-21.65, the South American Sub-basin. There are some differences between the Central basin size and boundaries to that of the DWR Groundwater Basin Number 5-21.65. The reason for the differences in the boundaries is due to the fact that the Central Basin was developed based on the Sacramento County IGSM Grid.  . For the purpose of this study, the area of DWR’s South Sub-Basin American sub-basin was chosen due to its natural boundaries of three perennial rivers. The Central Basin is defined as the area bounded on the west by the Sacramento River, on the north by the American River, on the south by the Consumes and Mokelumne rivers, and on the east by the Sierra-Nevada mountain range. Figure 1 presents the general location of the area Central Basin. The surface area of the Central Basin is 388 square miles (248,000 acre). The average annual precipitation in the basin ranges from about 14 inches along the western boundary to greater than 20 inches along the eastern boundary  . The eastern basin boundary is defined by the uprising foothills of the Sierra Nevada mountain range. This represents the approximate edge of the alluvial basin, where little groundwater flows into or out of the groundwater basin from the Sierra Nevada foothills  . The western portion of the Central Basin consists of nearly flat floodplain deposits from the Sacramento, American, and Consumes rivers. The DWR publication Bulletin 118-3, 1974, indicated that the groundwater movement in the Central Basin occurs in a shallow aquifer underlying by a deeper aquifer  . The shallow aquifer extends approximately 200 to 300 feet below the ground surface. While the base of deep aquifer averages approximately 1400 feet below the ground surface. The deep aquifer is separated from the shallow aquifer by a discontinuous clay layer, which serves as a semi-confining layer for the deep aquifer. The Central Basin aquifer generally receives its recharge from the rivers around the basin and precipitation infiltration. There might be some interaction with other basins but at very deep elevations  . Groundwater elevation in the Central Basin has been declining since the 1950s, with some recovery during the mid-1990s  . The recovery in 1990s was attributed to the increase use of surface water. Since then, the southern and central portions of the basin have an increased dependence on groundwater. Due to this reason, there has been a continuous trend of declining groundwater levels and a formation of a cone of depression. The groundwater levels generally vary between 10 and 90 feet below mean sea level in this south-central portion of the Central Basin, whereas conditions in the west and north have been stable  . The Central Basin’s potential average groundwater extraction rate is 273,000 AF/year with the extractions rates currently close to upper extraction limits. With the continuous increasing demand on water resources in the region, the Central Basin could face future depleted supply and major challenges of the sustainability of this supply. Therefore, it is important to explore other venues to maintain the basin’s long-term sustainability and meet future demand. Groundwater banking has become an integral component of any integrated water resources management plan to address both local and statewide water supply issues. Stakeholders from privately owned properties (or well owners) to local and state agencies are interested in the feasibility of groundwater banking in their respective basins. Relative to the construction of surface water reservoirs, groundwater banking in subsurface aquifers is a less controversial, lower cost, and more environmentally benign approach. Groundwater banking has numerous economic and environmental advantages compared to surface water storage. It reduces losses to evaporation. It allows for greater regulation of natural inflows, without the need to construct of large surface reservoirs  . As with any water storage systems, the main purpose of groundwater banking is to store surface water from precipitation and rivers, when water is abundant, and utilize those groundwater sources when the surface water supply stocks is scarce. The major obstacles to groundwater banking are the water conveyance from the source to the area of injection, cost of construction and maintenance of injection wells and regulatory and permitting requirements. The current study assumes that groundwater recharge aspect is an acceptable water management technique. This study was prepared to evaluate the feasibility of groundwater banking in the Central Basin. A three dimensional (3-D) model of the Central Basin was developed using the GMS with MODFLOW (from here on referred as GMS) software package  . The model was simulated with three actual historical data scenarios: above normal, wet, and critical years. Once the model was developed and calibrated, it was utilized to examine the impact of groundwater banking. Additional groundwater was banked through injection wells for each scenario to study its feasibility in the Central Basin. In order to carry out groundwater banking analysis, the Central Basin data were collected and compiled into a model, which is described as follows. The Sacramento Valley Water Year Type is determined by DWR’s California Data Exchange Center’s website (CDEC) based on Sacramento River and tributary runoff necessary to meet the Delta outflow criteria. Table 1 summarizes all possible water year types for the past seven years and the selected years of 2005, 2006, and 2008  .
Review of DWR publications was conducted to re-construct the complex geological formations in the Central Basin region. DWR publications provide detail information on layers of geologic formations in the region, but exact thicknesses of layers is not easily accessible from these publications. Therefore, the elevations of the different layers were estimated from a 2010 City of Roseville groundwater report called Sacramento Regional Model (SRM)  . 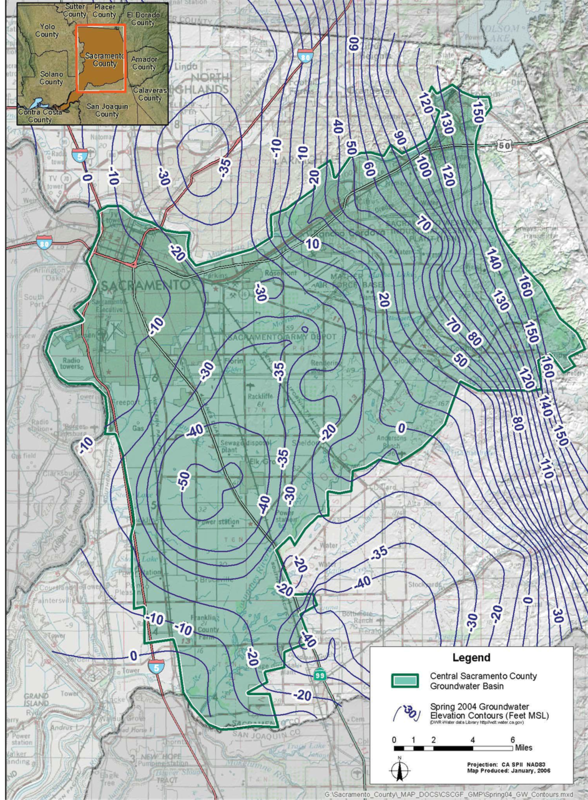 In 2010, Aquaveo performed this groundwater study for City of Roseville to assist in the planning efforts for an aquifer storage and recovery. The SRM study included an area of approximately 1360 square miles in the Greater Sacramento Metropolitan Region which encompasses the area of this study (Central Basin). SRM used the information on the thickness of the post-Eocene continental deposits defined in the DWR Bulletin 118-6. Furthermore, SRM turned this geological information into a 3-D stratigraphic model of the region with estimated thicknesses for the layers of the geological formations. This study extracted those estimated thicknesses for the Central Basin region from the SRM. Table 2 lists ten layers of these geologic formations that were reproduced for the Central Basins model. The estimated geological formation thicknesses were entered into the GMS model as boreholes, which were then converted into a solid stratigraphy of the Central Basin. The ground surface elevations are needed as an input parameter to the GMS model. The elevations were incorporated into the Central Basin region as the top of the surface soil for all the borehole data. The surface elevations were obtained from numerous sources including USGS and a number Geotechnical reports within the Central Basin region  - . The precipitation data for the selected three water years 2005, 2006 and 2008 were retrieved from DWR’s CDEC website. Table 3 shows the average annual precipitation for the selected years  . Average annual precipitation data for each of the selected water years were multiplied by the area (248,000 acres) of the Central Basin to obtain a volume of precipitation in acre-feet. Monthly variation of precipitation is not accounted for in this study. Table 4 summarizes the precipitation data and recharge rates  . River stage elevations (annual average) along with the bottom elevations and river conductance are the key elements needed as river data into GMS. DWR’s CDEC website provides stage elevation in feet for river stations, using the three letters station IDs. The river stage elevations used to develop the river system in Central Basin model are provided in Table 5  . 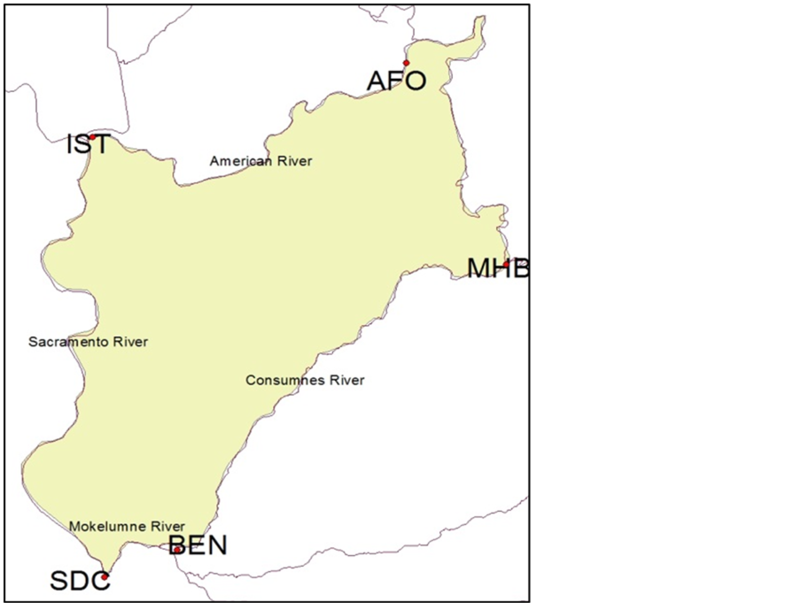 The locations of the river stations are shown in Figure 2  . River conductance is related to the rate at which a unit of riverbed material can transmit fluids, and is used mainly in hydrology in relation to river and lake beds. It is an application of intrinsic permeability to a unit of material with a defined area and thickness. In hydrology, the magnitude of conductance affects the rate of groundwater recharge or interaction with groundwater. This parameter is used in computer modeling codes as GMS. Table 6 shows the initial River Conductance values used as starting point in Central Basin model. Table 1 . DWR water year type. Table 2. Ten geologic formation layers. Table 3. Rain data for the selected year type. Table 5. River stations & stage elevation. Table 6. Initial river conductance. Figure 2. DWR’s river station IDs & locations. 2007-2008 Basin Management Report provided a comprehensive groundwater use data, including the agricultural use of groundwater in the Central Basin (Table 7)  . The total groundwater and agricultural uses are annual averages; hence, monthly variation is not taken into consideration as part of this study. The GMS model setup could be achieved using two approaches: the grid approach or the conceptual model approach  . The grid approach involves working directly with the 3-D grid, where conceptual model approach involves using GIS tools to construct the model and then it is converted into a 3-D grid. In the current study, a conceptual model approach was selected due to its applicability and flexibility to setup. The datum for the data needed for the GMS model was based on the State Plane Coordinate System with North American Datum 1983 (NAD83). A GIS shape-file containing rivers, streams and lakes in the Sacramento region was imported into GMS to provide information related to these water bodies. A background map was imported into the GMS model in order to provide ground surface elevations, visual guidance and spatial reference. The delineated project boundaries are shown in Figure 3. Figure 3. Central basin area & boundaries. Table 8. Well extraction flow rate. A total of twenty-two (22) boreholes were created and spread equally around Central Basin area to produce sufficient representative stratigraphy of the region. The borehole profiles are made of the geologic formation thicknesses estimated from City of Roseville study called SRM. Figure 4 shows the locations of all the boreholes across the Central Basin. Figure 5 shows the profile view of these boreholes. Triangulated Irregular Network (TIN) method was used to calculate an intermediate ground surface elevations between points of known elevations by linear interpolation. Figure 6 shows the top soils with the interpolated ground surface elevations using TINs. Each of the 22 boreholes has specific elevations according to the estimated thickness of the geologic formation and ground surface elevation. TIN method uses those borehole elevations and connects them to create solids for different layers stratigraphy as shown in the Figure 7. Five hundred and one (501) pumping wells were created in the conceptual model. The wells were classified based on the ownership entity: the DWR Wells (359), and the Non-DWR Wells (142). Figure 8 shows the locations of the DWR wells  , and Table 8 summarizes the wells extraction flow rate data  . After entering all the center blocks (materials and their respective layers, rivers, wells, precipitation recharge, and boundary and initial conditions) of the Central Basin model, then model now has all the components for various simulations. The conceptual approach was then converted into 3-D Grid. Figure 9 shows the 200 × 200 × 14 grid containing the 3-D region of the Central Basin. Figure 10 shows the model converted into the 3-D grids. Figure 4. Borehole locations and labels. Figure 5. Profile of borehole. was run through manual process by deleting the 3-D grid, under which all MODFLOW simulations are stored and regenerating it for the next calibration. This process was repeated about two hundred (200) times in order to produce solutions that closely resemble the observed targeted contour map values as shown in Figure 11. Figure 8. Locations of DWR wells. Figure 9. 3-D grid box. Figure 10. 3-D grid model of central basin. ment with a comprehensive research of the region’s soil properties prepared for the Sacramento Area Flood Control Agency (SAFCA). The SAFCA study evaluated a broad range of reports and they concluded that the K values in the Sacramento area ranges from 5 - 139 ft/day  . The results of the 2005 and 2006 water years were very similar to the observed target (with a maximum difference of 10%), with the only exception of the location of the cone of depression. Figure 12 shows the model result for 2005 water year. In general, the formation of the cone of depression in all of the models was in agreement with historical records of SCGA and DWR. The results showed that the cone of depression of the historical record is shifted to the north when compare to the observed target cone of depression. Results of the critical year type (2008) were also in agreement when compared to 2005 and 2006 water years’ results. The cone of depressions was deeper, and the inflow from rivers and precipitation to the aquifer was smaller due to decrease in the amount precipitation and the river stage elevations. Banking wells were added to the Central Basin model at the location of the cone of depression. Sacramento Regional County Sanitation District (SRCSD), a regional wastewater treatment plant located in the city of Elk Grove, is currently delivering 15,000 AF of recycled water for agricultural use to local cities  . Therefore, the 10,000 acre-feet of water was selected as a starting goal of this study to bank. The groundwater banking wells for this study, were constructed to allow the use of any amount more than 10,000 AF if needed. Figure 11. DWR contour calibration map. produce conclusive results. The locations of the banking wells were chosen to be in the center of the cone of depression, where it was found to be the most effective locations for groundwater banking. The cone of depression for all three selected years (above normal, wet and critical) was in the same vicinity. The injection of 10,000 AF of groundwater in the effective area seems to have marginally altered the shape of the depression cone. There were no significant changes in the water table elevation elsewhere in the basin. Figure 13 shows the contour map of the basin with the injection of 10,000 AF for banking. The results of the groundwater banking are summarized in Table9 It is clear that groundwater banking was more effective during the critical year since the water table elevation increased by 11 ft from 123 ft below Mean Sea Level (MSL) to 112 ft below MSL. While in the wet year (Figure 14), the change in groundwater table elevation was less dramatic. The change in groundwater table was only 7 ft from 99 ft below MSL to 92 ft below MSL. Figure 12. 2005 background contour map. Figure 13. 2008 contour map with 10 K AF. Figure 14. 2006 contour map with 10 K AF. Table 9. Results of groundwater banking. with the aquifer. In addition, the GMS model was constructed with complex geologic formation, soil conditions of the region and all of the associated material properties. The model was constructed in a unique way that allows for future modification depending on data availability. The results of this study showed that the cone of depression formulated during the different simulations is consistent with historical records. Historical analysis suggests that the formulation of the cone of depression is due to the excess of groundwater drafting in certain areas rather than the availability of resources for recharge. The size of the cone of depression was deeper during the critical year when compared to the above normal and wet years. It is further concluded that the banking up to 10,000 AF of groundwater during all three water year types (wet, above normal, and critical) is feasible in the Central Basin. The groundwater table elevation increased due to water banking in the all the scenarios studied. The highest increase in the predicted water table level was during the wet year scenario. The results also show that banking of 10,000 AF at the cone of depression will not cause negative impact elsewhere in Central Basin aquifer. • The extraction rate for each well is available and can be applied to individual wells. It will further increase the accuracy of the model. • The computer that was used in this study to develop the Central Basin model that was not sufficient to refine the grid around the wells. It is recommended to use a computer with significantly larger storage and processing power to allow for more refinement of the GMS grid to improve accuracy. • GMS is a strictly groundwater software and has limitation in applying precipitation and precipitation data. Therefore, if better surface runoff and percolation software is used and integrated with the GMS, it may improve the model further. • Building an accurate stratigraphy of the region is one of the most complex tasks of groundwater model construction. This is subject to change according to the availability of new information from all sources including but not limited to federal, state, local governments and private property owners. Therefore, it is recommended to have significantly more man-hours to improve the stratigraphy of the Central Basin. The authors of this study would like to acknowledge the staff for help of the City of Roseville, California and for providing the data needed to complete the study. Furthermore, the authors would like to thank Aquaveo LLC for providing valuable information, resource and support towards this study and for donating the GMS software. 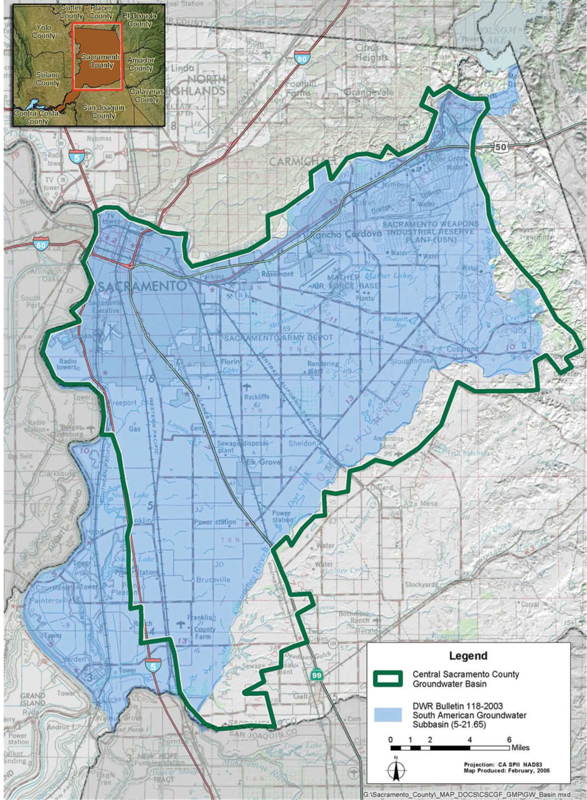 Central Sacramento County Groundwater Management Plan (CSCGMP) (2006). California DWR (2004) California’s Groundwater: South American Groundwater Sub-Basins Number: 5-21.65. Bulletin 118-6. California Department of Water Resource (DWR) (1974) Evaluation of Ground Water Resources: Sacramento County. Bulletin 118-3. DWR (1978) Evaluation of Ground Water Resources: Sacramento Valley. Bulletin 118-6. Natural Heritage Institute (NHI) (1998) Feasibility Study of a Maximal Program of Groundwater Banking. Groundwater Modeling System (GMS) with MODFLOW software. Version 8.0. (2011) Aquaveo, LLC, Provo, Utah. City of Roseville (2010) Sacramento Regional Model Groundwater Modeling Report. Aquaveo LLC. Morris, D.A. and Johnson, A.I. (1967) Summary of Hydrologic and Physical Properties of Rock and Soil Materials, as Analyzed by the Hydrologic Laboratory of the U.S. Geological Survey, 1948-1960. USGS Water Supply Paper: 1839-D.
Folsom Cordova Unified School District (2008) Geologic Hazard and Geotechnical Engineering Report. Wallace Kuhl & Associate Inc.
Youngdahl Consultating Group Inc. (2007) Geotechnical Engineering Study—Update 2007. Seasons at Laguna Ridge. CSA Water Pipeline and Florin Road Sewer (2009) Geotechnical Baseline Report. ENGEO Inc.
Elk Grove Promenade Center (2006) Geotechnical Engineering Report. Wallace Kuhl & Associate Inc.
Sacramento Central Groundwater Authority (SCGA) (2008) Basin Management Report 2007-2008. Sacramento Area Flood Control Agency (SAFCA) (2009) Appendix A: Groundwater Impact Analysis. Luhdorff & Scalmanini Consulting Engineers. Sacramento County Regional Sanitation District (SRCSD) (2011) South Sacramento County Agriculture & Habitat Lands Recycled Water Project Programmatic Feasibility Study.